The MT10B mouse biopotential telemeter provides high-quality data sampling at 2 kHz.  Each telemeter provides measurement of a single biopotential signal, such as ECG, EEG or EMG from a mouse living in its home cage. The single-use telemeters are shipped sterile and ready for implantation. The unique contoured surface is designed to minimize tissue irritation during subcutaneous implantation on the flank of mice >22g. 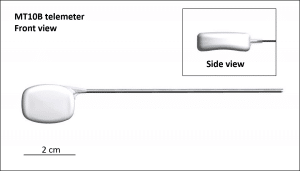 The telemeter has 8cm biopotential electrode leads and weighs approximately 3.0 grams (1.8 cm3). The telemeter does not contain a battery. Instead it receives power from inductive wireless power transfer when within 7 cm (vertical range) of the tBase surface. The telemeter provides 24/7 data transmission when powered by the tBase. The MT10B mouse telemeter requires the use of a tBase (MT110) and Configurator System (TR190 Configurator and ConfigSoft software).